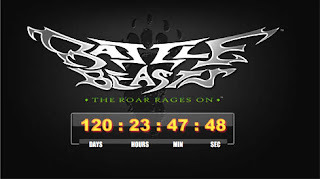 Battle Beasts: Trademarked at Diamond Since 2008? Have you ever gone digging through a trademark site? I did, and I found a couple of really interesting ones. Of the Diamond one, it says that it will cover such diverse ranges as: "Games and playthings, namely, board games, action figures, toy vehicles, electronic educational game machines for children, playing cards, card games, balls for games and sports, scale model vehicles, toy vehicles and radio-controlled scaled vehicles"
The most fascinating thing to me, though, is that this means they've had the brand since 2008. 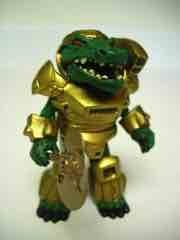 The first Diamond Select Toys Battle Beasts item was a promotional Minimates figure, given away in February 2010. I had no idea they've had it for so long! I just got this in the mail off of the eBay and I figured you might like to see it-- I never saw a review of this figure and will be posting one later. I've never seen a shot of the red Alligator figure-- which isn't named or even labeled as a Battle Beast with the carry case-- carrying his weapon before. The packaged case as no indication that it sports an exclusive figure, let alone a Battle Beast, which means that this is-- as the kids of 2009 might say-- a "packaging fail." Anyway, just wanted to share-- a full review will come later but I can't tell you how ridiculously happy finally seeing this little guy in person makes me. Three down, one to go, and just 110 days to go until we see if we're getting action figures, more Minimates or something else! Diamond Select Toys posted this countdown to... something. The countdown puts it at about April 12, 2012. So what does that mean? C2E2 is about this time, and they did give away a figure at that show in 2010. Could this be the news we've been waiting for? Previous info from my convention-goings-on indicated that this was on ice for a while so hopefully this will be a line launch or more than announcement... or worse, an announcement of a future announcement. I talked to a few of the guys at Diamond Select Toys about an update. I was told no additional Battle Beasts are planned in 2011, so yeah, there's that. As far as I can tell no branded Battle Beasts items are on deck for a while, but I've got high hopes someone will take the baton and do a similar line some day soon. Battle Beasts Minimates Not Quite Dead! Hey everybody! I had a brief chat with Diamond Select today and they told me that the Minimates Battle Beasts line is NOT dead yet! No new products were shown, but apparently the concept still has some life in it. More as I can find it! For the curious, no promotional Minimates were distributed at Toy Fair 2011. And not just Battle Beasts-- none at all were handed out this year, not even blank figures. Depending on who you ask, Battle Beasts were either an unforgettable toy line of the 1980s, or cheap rubber trash. I loved the little guys, and I went absolutely nuts when a promotional Minimates Battle Beasts Alligator was given away at Toy Fair 2010-- and another at Comic-Con, and another at C2E2 and yet another with a carry case. So far only this one creature is being released, and according to Diamond Select they sadly have no plans to do any more. It's really a pity, as this little guy is awesome.